← Easter Blessings to All! Wow, I knew it had been a while since I posted, but a whole month?? My lack of posting has not been an indicator of lack of work or creativity in my life! I finished that “quilt kit” that I told you about. I’m not sure my zig zag technique saves any time over sewing all the pieces of a traditional double wedding ring together, but I still enjoy it very much. I followed my sketch exactly, so there was no time spent rearranging on the design wall. 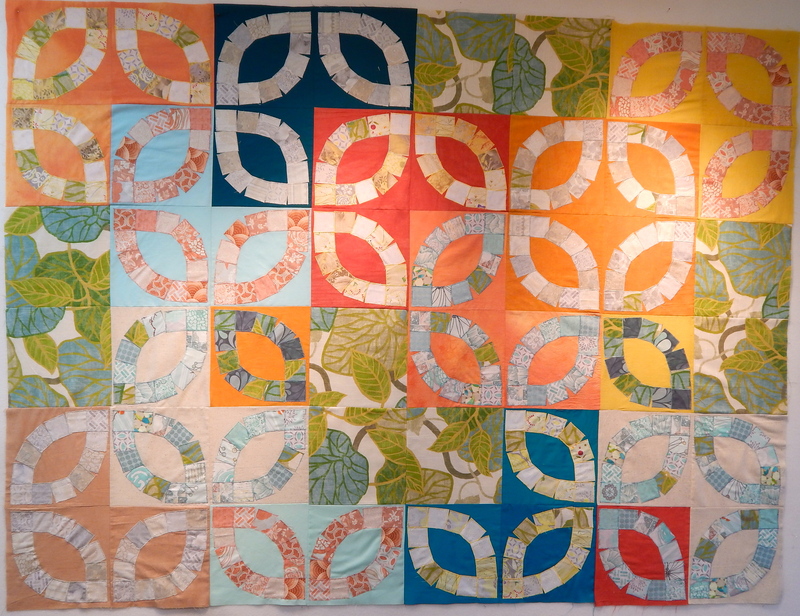 And then I finished the smaller quilt top that I had blogged about in my “Process” post. This was fun to do. I spent a lot of time figuring out which fabrics to use for the background. 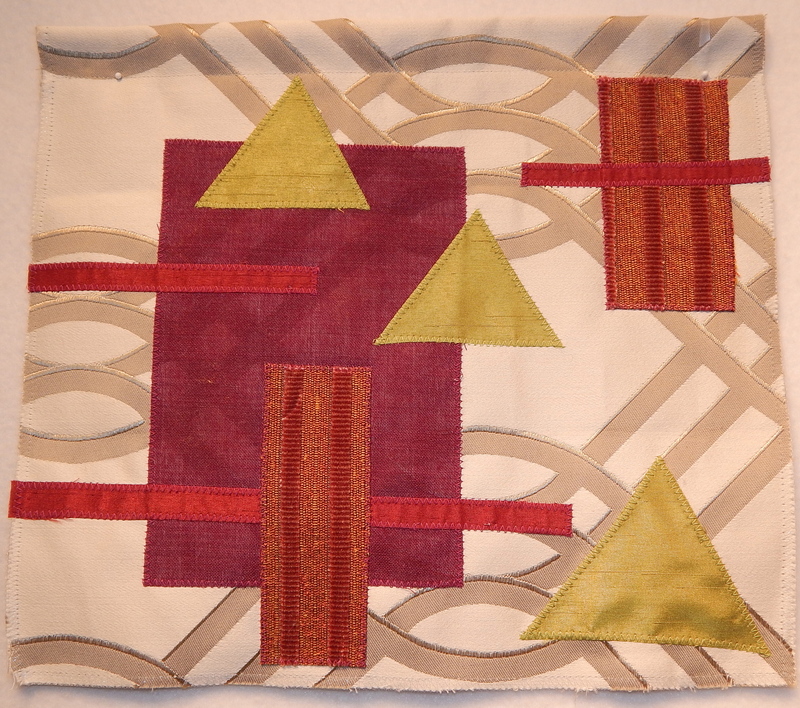 And the motifs were shapes suggested by my sketch for the previous quilt. They were free-hand cut and then zig-zagged in place. Making them one piece (instead of 12 squares) made that go a lot faster. I am considering doing some perle cotton embroidery on them. And then, I liked some of the background fabrics I had auditioned for the previous quilt so much that I made them into a top of their own. 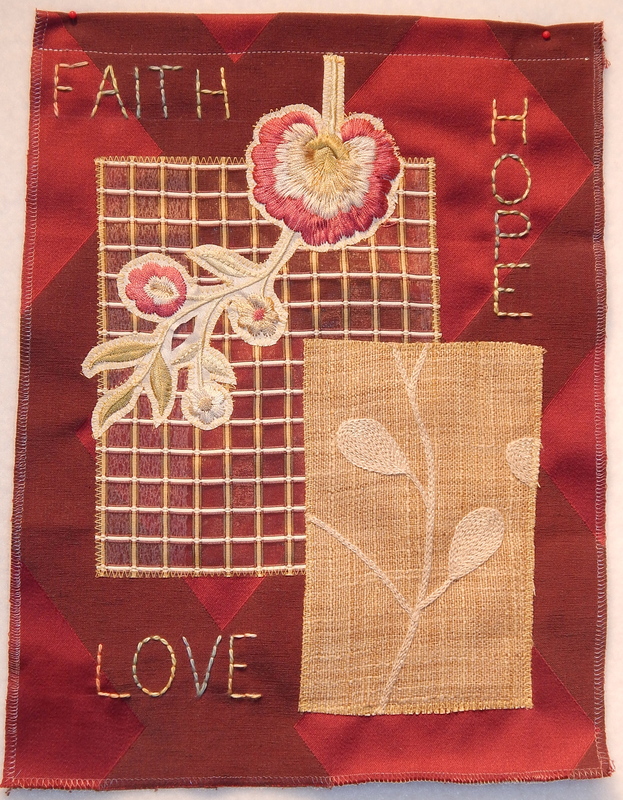 I am going to cross-cut this quilt top and insert a cross for “The Signature of Jesus” series. I could not find a dark fabric that I liked for the cross, so I am in the process of “making” some fabric for the cross. Very fun to do, but time consuming. 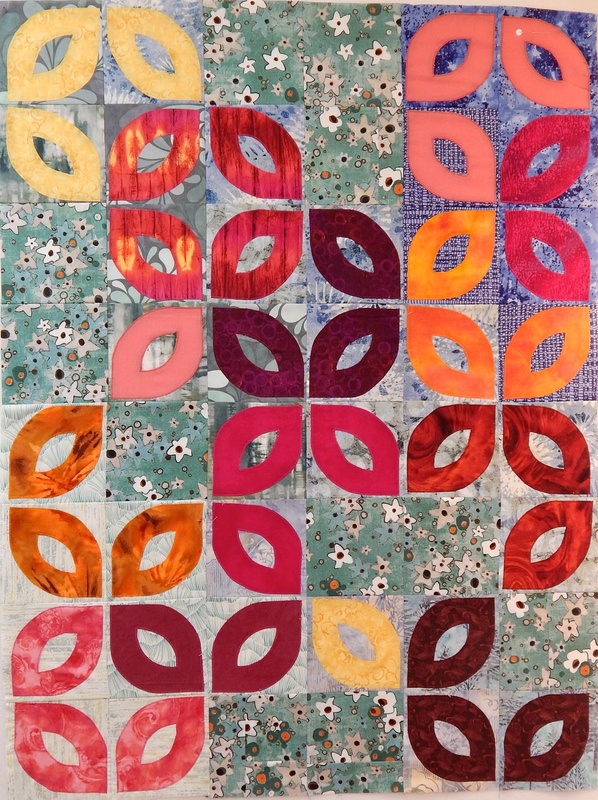 Oh, and somewhere in between all of that, I volunteered to work on a project for SAQA (Studio Art Quilt Associates.) This is for a “take and make” to encourage the public to make art of their own. I cut out LOTS of little pieces of fabric, and hemmed a bunch of blanks. And then I made some little samples. 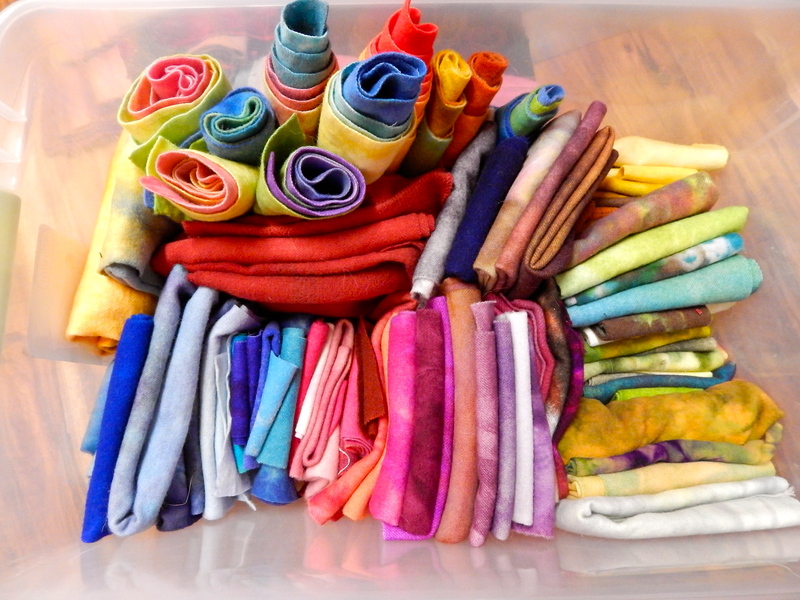 These are all made of bits and pieces of designer fabrics that we got at a place called FabMo in the bay area. The samples were very fun to make. No quilting involved. I realized that I didn’t have enough pale wool, so I had a little dying session. Very fun. But again, time consuming. And pretty much all the time that I would spend quilting or knitting I have spent working on this little “Persian” rug that I started in my workshop last fall. I don’t think I”ll finish it in time for camp, but I am very much enjoying working on it. And in between all of that, I have been gardening, and clearing out my bedroom in anticipation of J. the Contractor coming to work on my bedroom and closet while I am away. Ahhh. So now we’re all caught up. I’ll be back in a week or so with a report on all the happenings at rug hooking camp! Yowzers!!!! By contrast, I’ve been comatose!!!! I am totally in love with it all!!!! 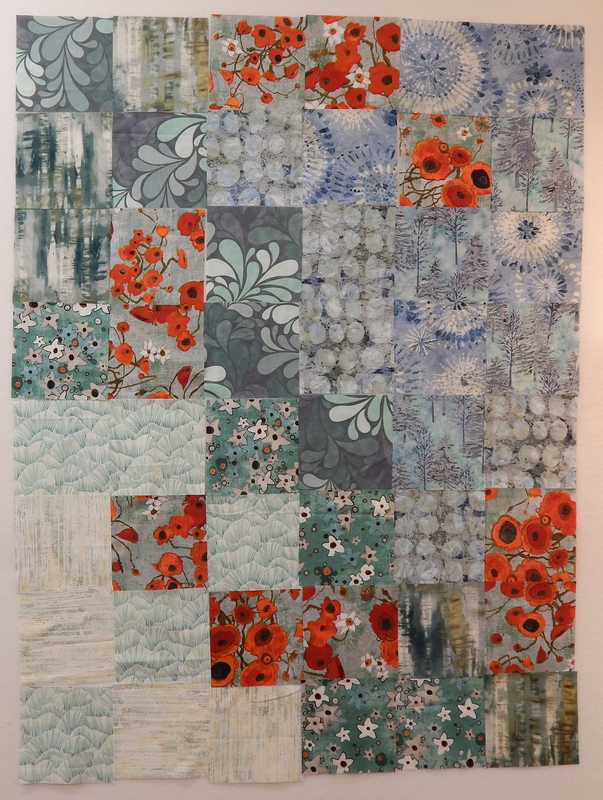 That “Gallery Fiori” fabric is my “beyond fave” line and you’ve really done them proud!!! The “Wedding Ring” variation turned out great and that second version is so appealing. Can’t wait to see what comes of the “slice/dice/insert” piece!!!!! All are so inspiring!! 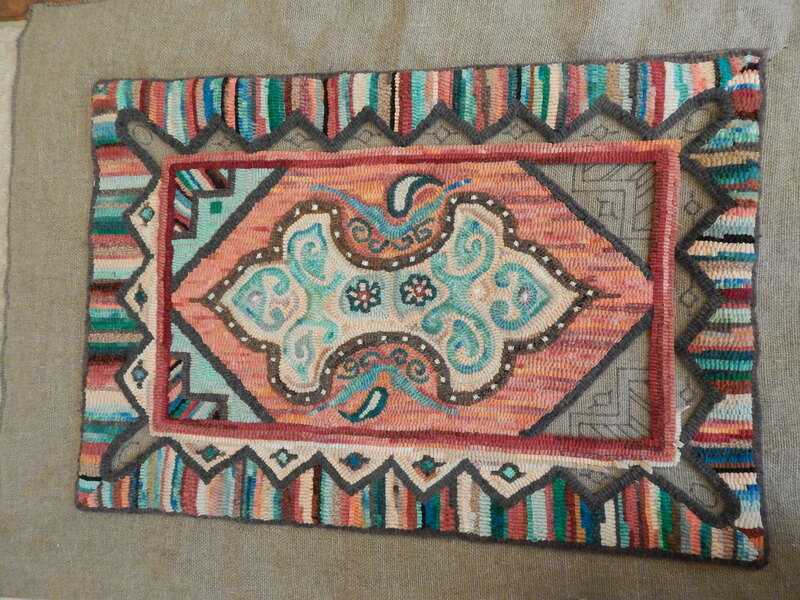 I’m not in to rug hooking but have a friend who is (http://www.oakridgecottagerugs.com/cart/agora.cgi?cart_id=3631637.6859*N_6fx1&product=home&ppinc=1a) and I so admire the art~ have fun and I really look forward to seeing your future posts!!! Hugs……………. Well thank you! Yes, I love that fabric too. 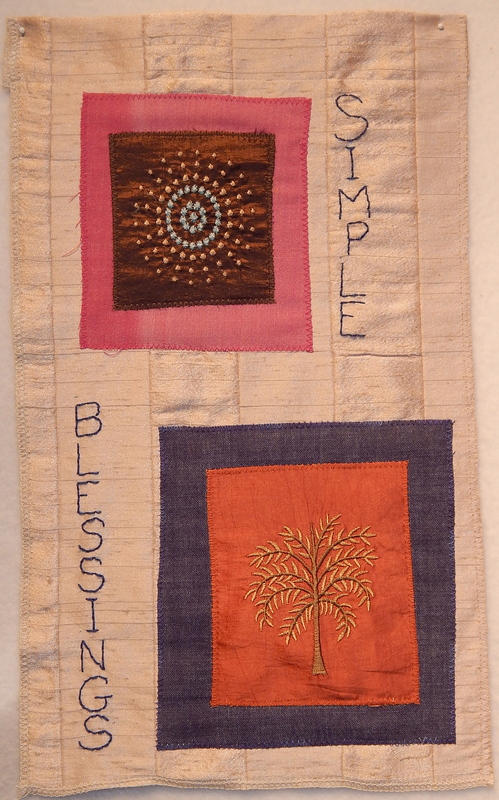 I used every last bit of it on the 3rd quilt. Thanks for the link–I’m going to check it out right now. I love the flags! Seeing the progression of a month’s work (plus, I know) is exhilarating! And the rug is beyond beautiful. 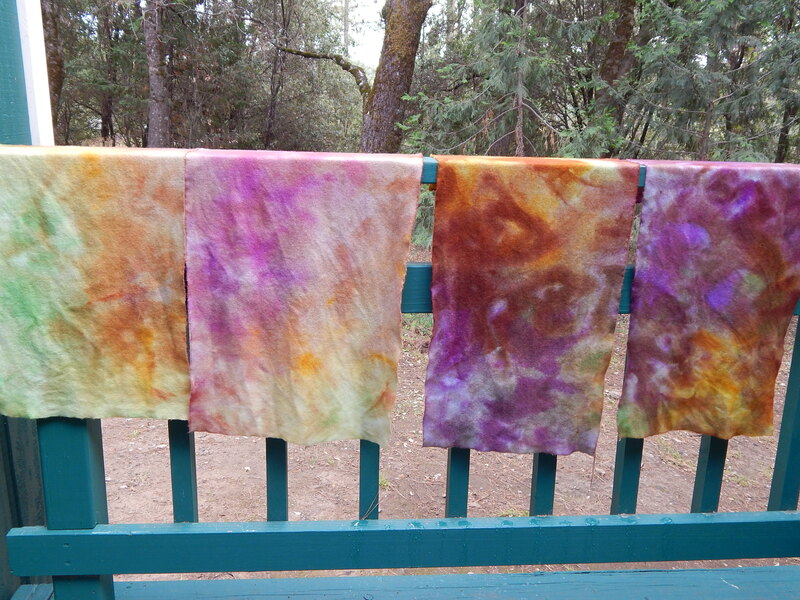 Love love the dyeing you did. Beautiful colors. Reminds me of some batik fabric I bought yesterday for a little project.